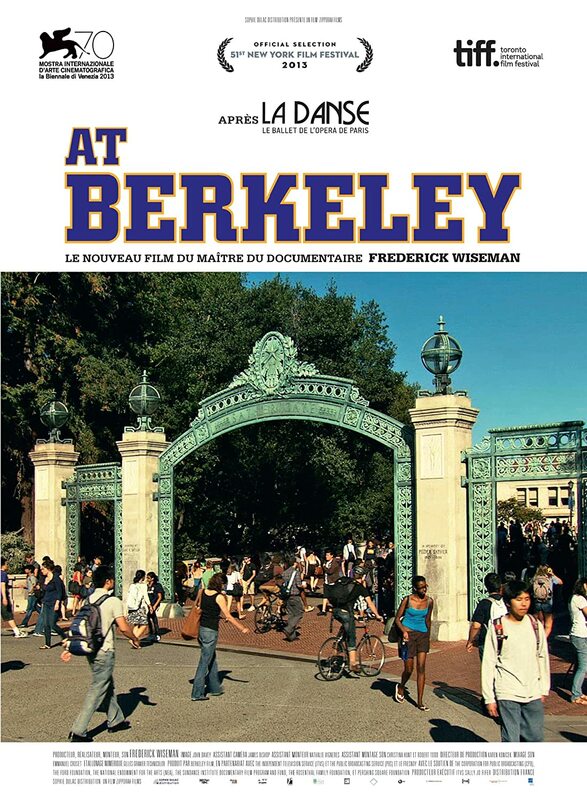 Frederick Wiseman’s brilliant documentary ‘At Berkeley’ which takes a long (4 hour) look at this large Californian university as it was in one semester of 2010. Despite its length, I warmly recommend it to anyone interested in education. As viewers we get to sit in on a wide range of lectures, seminars and performances including a full reading of e.e.cummings’ anyone lived in a pretty how town, presentations on cancer genes, Primo Levi, Robert Reich on leadership, how we perceive time and Thoreau’s Walden. These long takes, often from a single point of view, give us time to get a real sense of the content, teaching style and atmosphere of each session. Although we are mostly listening to a lecturer, we also get to see students’ reactions and hear their voices. Everyone who speaks has enough time to make and develop their point without ever being hurried along. There is no commentary, no added soundtrack or voiceover. We never eavesdrop private conversations, all the settings are group or public discussions. No one speaks to the camera or seems conscious of being filmed at all. No one is introduced or named unless it emerges naturally in conversation and the whole thing feels unmediated, although clearly every sequence has been carefully chosen. The university is allowed to speak through its staff and students as they go about their business in different settings. To add to the leisurely pace and sense of space, the longer sections are separated by vignettes of different campus locations; being maintained, rebuilt, walked through or used for relaxation or study. These sequences are unrushed celebrations of the quiet contemplation as well as the focused, organised activity needed to keep such a community going. Based on the number of students we see sitting on corridor floors, a few more seats might be an idea. The student body seems diverse, including a group of armed forces veterans on a return-to-education programme and with some mature students in evidence, although African Americans (7% of California’s population) seem to be under represented. Machines are watched as closely as humans and their contribution is scrutinised just as objectively; the gardener’s leaf-blower, the robot being programmed to fold a towel, the tarmac-laying machine and steam-roller. In one sequence, two research students, their supervisor and a man who has lost the use of his legs engage in a detailed discussion of the performance of the walking machine they have just trialled. We are at the intersection of theory, expertise and practical experience, and it takes time to tease out everything which might matter. At the core of the film is a serious existential challenge to the university as expressed by its amiable chancellor Robert Birgenau at a senior management retreat: how to preserve what is great about Berkeley in the face of continued massive reductions in public funding. We revisit this event several times as the university’s leaders explore the options open to them. The unflappable and ever-smiling chancellor Birgenau spells out the necessary reductions with zen-like positivity, confident that his senior team will find a way. The members of that team come all across as passionate and dedicated public servants; absolutely committed to meeting the needs of their community, widening participation and making an excellent higher education available to all. Many of them speak with pride of being Berkeley alumni themselves. The impact of spending cuts on tuition fees in particular, sparks a student occupation of the library. After an outdoor rally we follow the protestors into the library building and listen to them as they try to articulate what they want and to connect their campaign to wider social struggles. Many of these demands go well beyond anything the university leadership could do and the clearest of them is a call for free education. We also follow the university leadership’s contingency planning for the protest. They have much sympathy with the students and do their best to find some agreement and highlight the common ground they share around the need for more public investment in California’s university system. The former student activists among them can’t help comparing what they see as the clear, focused demands of their day to the contradictory mish-mash they have to respond to. In the end, the library seems to empty as quickly as it was filled and it all seems fairly tame when compared to the Free Speech, civil rights and anti-war protests and the violent response to these which the campus experienced in the 1960’s. Robert Birgeneau himself says: ‘The US has many great private universities, what it needs are great public universities’ and, despite its problems, Berkeley is clearly one of the greatest. It is 8th in the World University rankings and has 72 Nobel prize winners among its alumni and faculty. However, preserving the ideal of a public university for all, regardless of income, when state funding has fallen from 54% to 12% of income over the last 25 years is a real challenge. Tuition fees are set at a little over £8,000 per year (well below private university fees in the US) with 37% of students receiving means tested financial aid and one in six receiving scholarships. But as one of the student speakers at the rally pointed out, in the 1960’s when Free Speech Movement activist Mario Savio was at Berkeley, he paid no tuition fees. So what are the prospects for the public university and what lessons might we draw from ‘At Berkeley’ on this side of the Atlantic? One the one hand, considering the sky-high fees and complex web of federal loans which US students have to negotiate we can congratulate ourselves in the UK on our simpler, fairer national student loan system which has not put off poorer students from going to university. On the other hand, the shift to a loans system in the UK has also been a shift away from the ideal of the public university. If the state’s main role is to underwrite loans to individual students (and fund some research) higher education effectively becomes a market transaction. The prospect of a university which might be held to account democratically for meeting the educational needs of its wider community recedes and responsiveness becomes a matter of choice for the universities themselves. Berkeley may be highly selective and receive less than one eighth of its funding from the state but it is part of a vibrant US public higher education sector keeping alive the idea of the public university and for that we should be grateful. ‘At Berkeley’ may seem a little long for a documentary, but 4 hours spent in such a great learning community getting to know some of its people and some of its concerns is time well spent. The DVD of ‘At Berkeley’ can be found here. A trailer for the film can be viewed here. This entry was posted in Education, Reviews and tagged 'At Berkeley', Berkeley, California, film, Frederick Wiseman, Public education, student loans. Bookmark the permalink.